In the first in a new feature series on first jobs in agriculture, Howard Walsh meets Rachel Gilder whose involvement in Young Farmers cemented her interest in the agricultural industry. Worcestershire beef, sheep and arable farmer’s daughter Rachel Gilder has always been involved in farming, helping out on the family farm as she still does. But she says during her school years, some of the careers which came up for discussion around the table at home in Strensham, were far removed from the path she eventually pursued. And it has by no means been an easy ride. 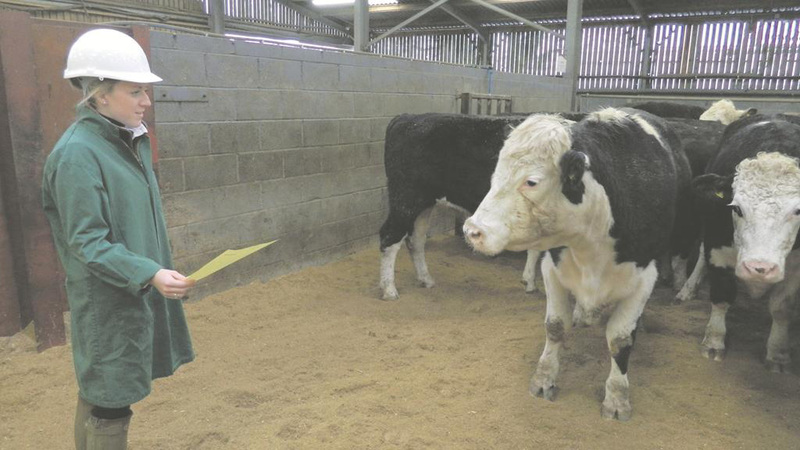 Rachel, who is the county’s stockjudging co-ordinator this year, says: “I became involved with Upton-upon-Severn YFC when I was about 14 and it was YFC, not least the stockjudging events which I was particularly keen on, which have probably benefited me most through all stages of my life since school. “We have a traditional beef, sheep and arable farm and I became interested in what dad was doing, why he did things the way he did, and why we were producing cattle, lambs and grain to a certain specification. “Through past and present students, I got to know about Harper Adams University. And by the time I was doing A-levels, it became my goal, specifically the agri-food marketing side. After studying geography, business and psychology, she gained a place at Harper Adams in 2009 to read for an honours degree in agri-food marketing with business studies. With a preferred career path already centred on the red meat industry, Rachel’s year out was spent at a meat processing firm in Bishops Castle, Shropshire, owned by Daysdrove Holdings. It was small enough to enable her to work through various departments, including office-based work, sales and later procurement. However, Irish-owned multi-species meat processor Dunbia had always been Rachel’s company of choice, although, for her year out, there had been no opportunities with available. “I applied to the company again in the November of my graduation year. I had met Barbara McAvoy from the Dunbia Sawley HR department at a careers day at university, who had told me there was a job in the pipeline in procurement. “Basically, it all stemmed from there. I followed it up, had a chat with procurement manager Adrian Fell, then had to attend an assessment day. I had to do a presentation and ‘sell’ Dunbia to the panel. “Six weeks passed and I hadn’t heard anything, until a contract arrived. You can imagine my reaction. I took a month out after graduation, then packed my bags and moved up to Sawley, which is close to the Lancashire/Yorkshire border. At Dunbia, Rachel went straight onto the graduate training scheme which laid out what she would be doing. There was some flexibility and she worked across all the different departments over a period of 12 months. She says: “Before the end of the full course, I had done pretty much everything and I just wanted to get on with the job proper. I thought it would be pretty straight forward – buying stock straight away. “But I was young and female, in a buyer’s role. In this industry, accepting young people with little experience takes time. There was no chance I was going to buy cattle straight away. “I might have taken two or three days out per week to visit farms and not buy a single animal. “However, it is now all starting to fall into place, and having a colleague in Dunbia who had followed the same route as myself was a great help. He reminded me ‘don’t let it get you down. You are in a predominantly male environment and you just have to stick at it’, which is what I did. Rachel began in beef procurement, but always wanted to progress to lamb as well, which is what she has done. Buying lambs liveweight of course means buying in markets. “The first time buying in a market is challenging to say the least. If you aren’t of the right character for the job, you would walk out of there and that would be that. Looking back, does she believe she made the right career choice? And the rewards can be as simple as getting a new deadweight supplier on-board or even just being ‘accepted’ and given more responsibility. Rachel says she fully appreciates the business from the opposite side of the farmgate. “Farmers often do not necessarily appreciate the repercussions created further up the chain from what they might just regard as a trivial oversight or mistake. “Just one person not checking an eartag or passport can cause significant, time-consuming problems at an abattoir, as can stock presented dirty or not being farm-assured when they have been declared as being so. We are collectively the supply chain and need to work together. “I organise farmer visits to our sites which I see as an educational opportunity for farmers. It is really only when they come for the first time and see the whole process when some of them grasp how something such as a wrong passport is a problem. “We cannot kill an animal unless we physically have the correct passport – and it is a problem we see almost every day. It is the same with wrong tags. “Cattle can be held overnight until the problem is resolved via the official veterinary surgeon, BCMS or even Trading Standards. “Of course, nine out of 10 are genuine mistakes, but nevertheless are costly for us and the farmer. As for the future, Rachel says she is continually gaining experience and is motivated through personal rewards. She strives to fully utilise career opportunities within Dunbia, the largest processor of lamb and the second largest processor of beef in the UK and Ireland. The plan involved visits to each Dunbia site and several supplier farms, but with in-depth training on all aspects of the business at Dunbia Sawley.